And how a half-hour of light romantic music hosted by Jim Ameche with Ray Bloch and His Orchestra and Chorus and vocalist Larry Douglas. 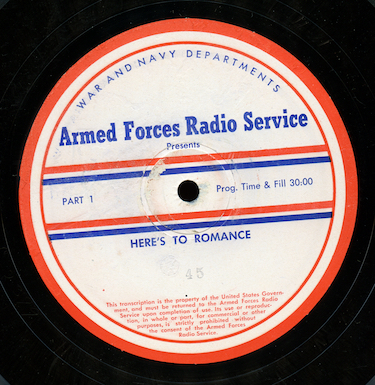 Program 45 in the series as it was heard on the Armed Forces Radio Service kicks off with the romantic ballad “When Johnny Comes Marching Home” (?!?). Our show was dubbed directly from an original vinyl 16” Armed Forces Radio Service transcription. There’s an indication in the matrix that the disc is “dubbed”, so this is probably a show assembled from parts of various other episodes. And deepest thanks to blog listener William Harris for his donation of the disc to the collection!